MSR-Electronic: Process industries such as Oil & Gas, Petrochemical, Refinery and Chemical industries need special precautions to handle different hazardous substances that are used in the process or are present in the atmosphere. For the protection of human beings and tangibles, constant monitoring of toxic and combustible gases and vapours is required. 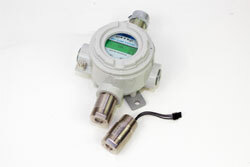 The gas detection sensors of MSR-Electronic for monitoring such hazardous gases need to be installed and maintained in extreme harsh conditions. Hence such products need to comply with general standards and regulations that guarantee the safety of the system. MSR-Electronic offers a wide range of products for the detection of gas including the PolyXeta®2 system with SIL 2, ATEX and IECEx certification to suit nearly every industrial application where extreme environmental conditions prevail. Furthermore, these devices are provided with exchangeable sensors which guarantee easy, time and cost saving recalibrations. Finally, all devices are fully integrable into existing systems, e.g. via Modbus. With MSR-Electronic you improve your safety, profitability and your competitiveness. For more detailed information please visit us on the ACHEMA 2018 (hall 9.1, A86) or on our new web shop www.msr-24.com.